This was one of those weeknight dinners that was almost too good to be true. Everyone had seconds and thirds. The kids couldn’t get enough of it. It was pretty and colourful and looked SO good on the table. It was fresh and healthy. It was fast and simple – 20 mins prep time. The flavour combination made my tastebuds sing. The beef marinade was delicious*, the pickled onions were tangy and salty and sweet, and the creamy garlic aoli finished it all off to perfection. It’s the perfect mouthful of flavour. 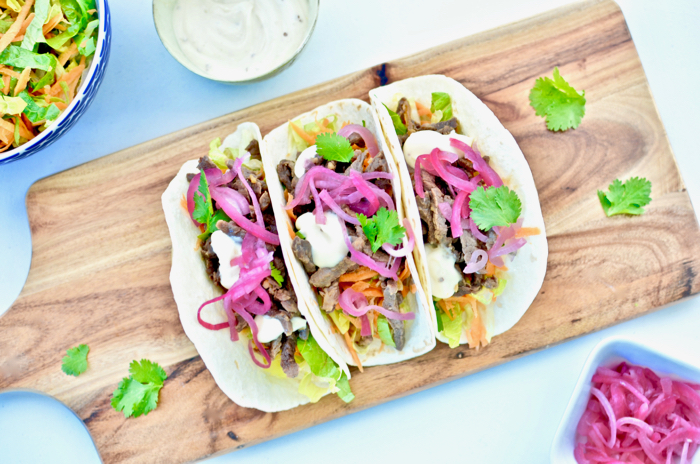 Soft tortillas heaped with shredded lettuce and carrot, tender juicy beef, sweet tangy pickled onions, and creamy sauce… It’s actually making my mouth water just thinking about it. It also led to an interesting discussion when we asked the kids what country they thought this recipe came from. Let’s just call it Asian-Mexican fusion. Does that sound about right? Apart from how quick and tasty it was, the thing I loved most about this dinner was its uniqueness. It was a completely different twist for us – something we’d never had before, but that still felt familiar and comforting. And when you’ve been cooking dinner near-nightly for 17 years, a genuinely fresh idea is a rare treat. Especially when it hits a home run with kids and adults alike. Okay, enough chit-chat, I’ll give you the recipe already. Because you are gonna want to get this deliciousness in your mouth asap. Make a marinade with the crushed garlic, soy sauce and honey. Toss the beef in the sauce and leave to marinate for at least 15 minutes. Slice the red onion very finely. Combine the vinegar, water, sugar and salt in a small bowl, then add the onion and stir to coat. Leave the mixture to sit. Grate the carrot and finely shred the lettuce. Chop the coriander leaves (retaining some whole leaves as a garnish). Combine the carrot, lettuce and chopped coriander in a bowl. Add a drizzle of olive oil, and a light grinding of salt and pepper. Heat olive oil in a wok or frying pan over high heat. Drain the red onion and sautée until softened. Set aside. Stir-fry the beef for 3-4 minutes, until cooked through. Warm the tortillas in the microwave for 15 seconds. Assemble tortillas with a handful of shredded salad, Korean beef, pickled onion, and a dollop of aoli. Scatter with remaining coriander (cilantro) leaves to serve. 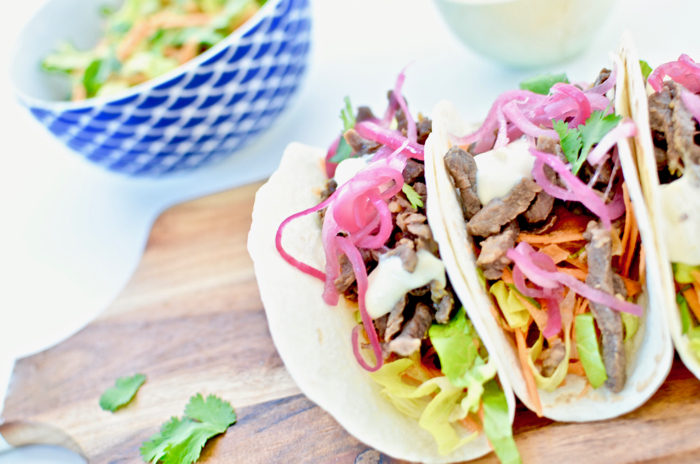 So, do you want the lowdown on the Korean beef tacos? This is a HelloFresh recipe. HelloFresh is a meal kit subscription service that we’ve been using for about six months now. You can read my complete review of HelloFresh here. Some of my thoughts have changed after a few months in, though, so to find out the negatives we’ve come across as well as the positives, read on. We love it because I was getting stuck in a rut with meal planning and needed to shake things up a bit. Plus, it’s hard grocery shopping with small kids. Now I only ever have to grab a few things, and even if I haven’t made it to the shops that week, I know there will always be something fresh and healthy in the fridge for dinner. It’s my safety net. Best of all, the food is fantastic, and it’s pushing us to try new things. Several of the recipes have become firm family favourites that I will use again and again. So, the downside. The main issue for me is that every recipe you receive is new, every week. Of course, this is also a positive (and one of the main reasons I signed up in the first place), but even though the meals are simple, I think it always takes more concentration to read and follow a completely new recipe than one you’ve made before. I ended up pausing my subscription for a couple of weeks – except then I panicked because my fridge was bare. Funny, that! Ha! After two weeks of having to come up with my own inspired meal ideas and lug everyone to the shops to make it happen, I was more than ready to jump back in with HelloFresh. Except now, I’ve changed my subscription so I only get a delivery every 2nd week. That has worked out to be the perfect rhythm for our family. I have no problem using up the kits, and we have some flexibility if we want to eat leftovers, get takeaway or just have some super-easy meals if we’re extra busy. Are there any other downsides? Well, even though we personally love it, this service definitely won’t be for everyone. HelloFresh do a good job of creating meals with fairly wide appeal, but everyone’s tastes are different. If you’re a meat-and-three-veg person and you don’t particularly like trying new things, it probably won’t float your boat. And it no doubt goes without saying, but the business model is based on a margin – you would definitely be able to recreate the meal kit ingredients for cheaper if you shopped around yourself. So if budget is your primary concern, this may not be right for you, either. I’m not a good budget shopper myself, so we’ve found that we actually save money overall. The quantities are proportioned correctly, which means there’s a lot less waste. But our results may not be typical. If you do want to try it out for yourself, it’s cheaper to do it with my coupon code. I am able to offer this discount because I’m an affiliate for HelloFresh (meaning I earn a commission if you purchase a meal box through me, at no extra cost to you) – but I only recommend HelloFresh because we use it personally and love it so much. I will never recommend anything to my readers that I would not recommend to my best friend. I’m always happy to share something that has genuinely made my life better, in case it’s helpful for someone else too. A trial box is always a good idea, just to see if you like it. You won’t be signed up to anything with your first box, so there’s no harm done if you decide it’s not for you. If you do want to give it a try, just click through with the appropriate button below. The coupon is embedded, so your discount will be automatically applied. 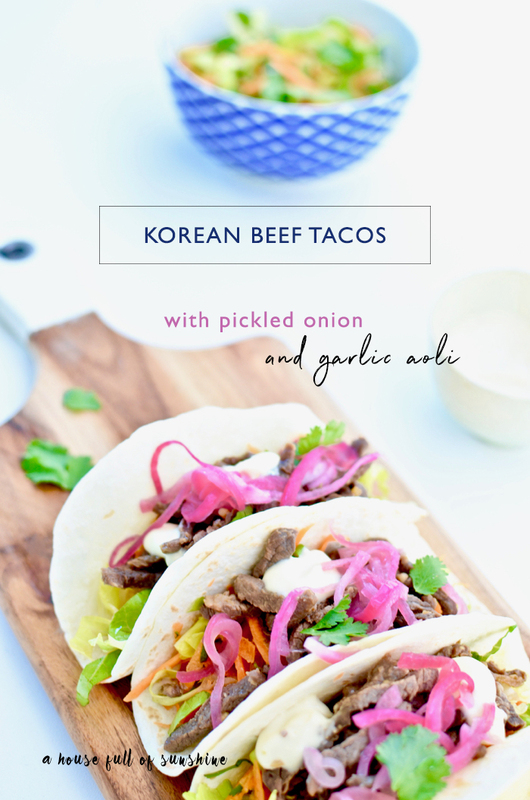 I hope you enjoy these Korean beef tacos – let me know if you try it! I’d also love to hear from those of you who’ve already tried out HelloFresh. What did you think? Any highs, lows or advice to give?